When your company finds itself in need of a Chief Financial Officer but without the financial resources to fund the full time financial commitment such a seasoned professional requires, our staff solves this puzzle by providing seasoned professional support on a contract basis. Whether your company is growing beyond the current accounting staff's capabilities to provide strategic planning, you are downsizing to meet current market conditions, or your company is in a difficult workout situation, our seasoned staff can provide the temporary support you need to bridge the gap until a more stabilized environment can be achieved. Expertise & Core Competencies. Using our contract CFO services enables a company to focus on core competencies while gaining the necessary financial expertise that works for the company’s budget. Instead of the financial burden of a full time CFO salary that may not be working in a CFO capacity, a Contract CFO provides those services and elements on an as needed basis. Division of Labor. Division of labor is easy to facilitate. An accountant or controller will provide basic bookkeeping, record keeping, check writing, analysis of accounts, and generation of financial statements under the direction and supervision of a contract CFO. At the same time, the contract CFO can concentrate on necessary financial analysis, projections, strategic analysis, and banking, as well as reporting information to owners, developing tax strategies, and working with attorneys. It is normal for a competent CFO to have little interested in, or be challenged or motivated by, performing basic bookkeeping functions. Save Money. It can be more economical to have a full time bookkeeper and a contract CFO than either one person serving as a bookkeeper and CFO, or in some cases only a CFO. A contract CFO can be more economical when the needs for the contract CFO do not constitute a full–time position, particularly in smaller companies or in companies where the workload varies. 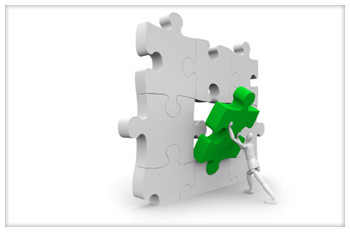 Contact us today to see how our CFO services can complete the puzzle of providing professional talent at a fraction of the cost to your organization.